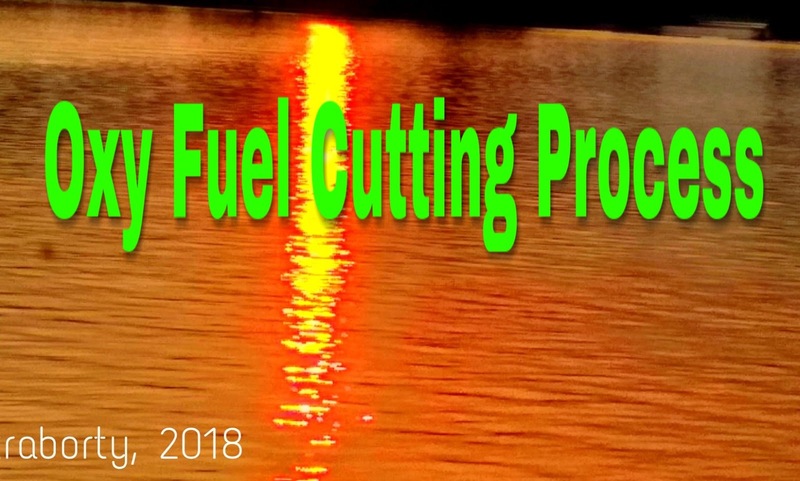 Oxy-fuel cutting is processes that use fuel gases and oxygen to cut metals. Most commonly fuel gas are acetylene, natural gas, propane, hydrogen, propylene, liquefied petroleum gas (LPG), and combinations of these gases. In oxy-fuel cutting, a torch is used to heat metal to its kindling temperature. A stream of oxygen is then trained on the metal, burning it into a metal oxide that flows out of the kerfas slag. Before cutting,the cutting torch has to pre-heat the metal to ignition temperature at the starting point, the steel has lost protective properties against oxygen and is still solid. Pure oxygen is then directed through the nozzle at the heated area. This fine and high pressure oxygen stream changes pre-heated and unprotected steel into oxidised liquid steel by an exothermic reaction. 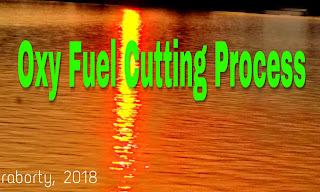 The appliance used in oxy-fuel cutting process are oxygen cylinder, fuel cylinder, pressure regulator, non-return valve, flexible hosepipe, Cutting torch. An oxygen cylinder is an oxygen storage vessel, which is either held under pressure in gas cylinders, or as liquid oxygen in a cryogenic storage tank. A fuel cylinder or tank is a pressure vessel for storage and containment of gases at above atmospheric pressure. High-pressure gas cylinders are also called bottles. Inside the cylinder the stored contents may be in a state of compressed gas, vapor over liquid, supercritical fluid, or dissolved in a substrate material,depending on the physical characteristics of the contents. A typical gas cylinder design is elongated, standing upright on a flattened bottom end, with the valve and fitting at the top for connecting to the receiving apparatus. A pressure regulator is a control valve that reduces the input pressure of a fluid to a desired value at its output. Regulators are used for gases and liquids, and can be an integral device with an output pressure setting, a restrict or and a sensor all in the one body, or consist of a separate pressure sensor, controller and flow valve. A non–return valve allows a medium to flow in only one direction. A non–return valve is fitted to ensure that a medium flows through a pipe in the right direction, where pressure conditions may otherwise cause reversed flow. The hoses are designed for use in welding and cutting metal. A double-hose or twinned design can be used,meaning that the oxygen and fuel hoses are joined together. If separate hoses are used, they should be clipped together at intervals approximately 3 feet(1 m) apart, although that is not recommended for cutting applications,because beads of molten metal given off by the process can become lodged between the hoses where they are held together, and burn through, releasing the pressurised gas inside, which in the case of fuel gas usually ignites. The hoses are color-coded for visual identification. The color of the hoses varies between countries. In the United States, the oxygen hose is green, and the fuel hose is red. In the UK and other countries, the oxygen hose is blue (black hoses may still be found on old equipment), and the acetylene (fuel) hose is red. If liquefied petroleum gas (LPG) fuel, such as propane, is used, the fuel hose should be orange, indicating that it is compatible with LPG. LPG will damage an incompatible hose, including most acetylene hoses. The threaded connectors on the hoses are handed to avoid accidentals-connection: the thread on the oxygen hose is right-handed (as normal),while the fuel gas hose has a left-handed thread. The left-handed threads also have an identifying groove cut into their nuts. Gas-tight connections between the flexible hoses and rigid fittings are made by using crimped hose clips or ferrules,often referred to as ‘O’ clips, over barbed spigots. The use of worm-drive hose clips or Jubilee clips is specifically forbidden in the UK and other countries. A cutting torch head is used to cut materials. It is similar to a welding torch, but can be identified by the oxygen blast trigger or lever. When cutting, the metal is first heated by the flame until it is cherry red. Once this temperature is attained, oxygen is supplied to the heated parts by pressing the oxygen-blast trigger. This oxygen reacts with the metal, forming iron oxide and producing heat. It is the hearth at continues the cutting process. The cutting torch only heats the metal to start the process; further heat is provided by the burning metal. The melting point of the iron oxide is around half that of the metal being cut. As the metal burns, it immediately turns to liquid iron oxide and flows away from the cutting zone. However, some of the iron oxide remains on the work piece, forming a hard “slag” which can be removed by gentle tapping and/or grinding. A cutting torch has a 60- or 90-degree angled head with orifices placed around a central jet. The outer jets are for preheat flames of oxygen and acetylene. The central jet carries only oxygen for cutting. The use of several preheating flames rather than a single flame makes it possible to change the direction of the cut as desired without changing the position of the nozzle or the angle which the torch makes with the direction of the cut, as well as giving a better preheat balance. Manufacturers have developed custom tips for Mapp, propane, and polypropylene gases to optimize the flames from these alternate fuel gases. The torch’s trigger blows extra oxygen at higher pressures down the torch’s third tube out of the central jet into the work piece, causing the metal to burn and blowing the resulting molten oxide through to the other side. The ideal kerf is a narrow gap with a sharp edge on either side of the work piece; overheating the work piece and thus melting through it causes a rounded edge. Cutting is initiated by heating the edge or leading face (as in cutting shapes such as round rod) of the steel to the ignition temperature (approximately bright cherry red heat) using the per-heated jets only, then using the separate cutting oxygen valve to release the oxygen from the central jet.The oxygen chemically combines with the iron in the ferrous material to oxidize the iron quickly into molten iron oxide, producing the cut. Initiating a cut in the middle of a work piece is known as piercing. The oxygen flow rate is critical; too little will make a slow ragged cut, while too much will waste oxygen and produce a wide concave cut. Oxygen lances and other custom made torches do not have a separate pressure control for the cutting oxygen, so the cutting oxygen pressure must be controlled using the oxygen regulator. The oxygen cutting pressure should match the cutting tip oxygen orifice. Consult the tip manufacturer’s equipment data for the proper cutting oxygen pressures for the specific cutting tip. Since the melted metal flows out of the work piece, there must be room on the opposite side of the work-piece for the spray to exit. When possible, pieces of metal are cut on a grate that lets the melted metal fall freely to the ground. The same equipment can be used for oxyacetylene blowtorches and welding torches, by exchanging the part of the torch in front of the torch valves. For a basic oxy-acetylene rig, the cutting speed in light steel section will usually be nearly twice as fast as a petrol-driven cut-off grinder. The advantages when cutting large sections are obvious: an oxy-fuel torch is light, small and quiet and needs very little effort to use,whereas a cut-off grinder is heavy and noisy and needs considerable operator exertion and may vibrate severely, leading to stiff hand-sand possible long-term vibration white finger. Oxy-acetylene torches can easily cut through ferrous materials in excess of 200 mm (8 inches). Oxygen lances are used in scrapping operations and cut sections thicker than200 mm (8 inches). Cut-off grinders are useless for these kinds of application. Robotic oxy-fuel cutters sometimes use a high-speed divergent nozzle. This uses an oxygen jet that opens slightly along its passage. This allows the compressed oxygen to expand as it leaves,forming a high-velocity jet that spreads less than a parallel-bore nozzle,allowing a cleaner cut. These are not used for cutting by hand since they need very accurate positioning above the work. Their ability to produce almost any shape from large steel plates gives them a secure future in shipbuilding and in many other industries. Oxy-propane torches are usually used for cutting up scrap to save money, as LPG is far cheaper joule for joule than acetylene, although propane does not produce acetylene’s very neat cut profile. Propane also finds a place in production, for cutting very large sections. Oxy-acetylene can cut only low- to medium-carbon steels and wrought iron.High-carbon steels are difficult to cut because the melting point of the slag is closer to the melting point of the parent metal, so that the slag from the cutting action does not eject as sparks but rather mixes with the clean melt near the cut. This keeps the oxygen from reaching the clean metal and burning it. In the case of cast iron,graphite between the grains and the shape of the grains themselves interfere with the cutting action of the torch. Stainless steels cannot be cut either because the material does not burn readily. Acetylene is dangerous above 1 atm (15 psi) pressure. It is unstable and explosively decomposes. Proper protection such as welding goggles should be worn at all times,including to protect the eyes against glare and flying sparks. Special safety eye wear must be used—both to protect the welder and to provide a clear view through the yellow-orange flare given off by the incandescence flux. In the1940s cobalt melters’ glasses were borrowed from steel foundries and were still available until the 1980s. However, the lack of protection from impact,ultra-violet, infrared and blue light caused severe eyestrain and eye damage. Didymium eye wear, developed for glassblowers in the 1960s, was also borrowed—until many complained of eye problems from excessive infrared, blue light, and insufficient shading. Today very good eye protection can be found designed especially for gas-welding aluminum that cuts the sodium orange flare completely and provides the necessary protection from ultraviolet, infrared, blue light and impact, according to ANSI Z87-1989 safety standards for a Special Purpose Lens. Fuel gases that are denser than air(Propane, Propylene, MAPP, Butane, etc…), may collect in low areas if allowed to escape. To avoid an ignition hazard, special care should be taken when using these gases over areas such as basements, sinks, storm drains, etc. In addition, leaking fittings may catch fire during use and pose a risk to personnel as well as property. On an oxyacetylene torch system there will be three types of valves, the tank valve, the regulator valve, and the torch valve. There will be a set of these three valves for each gas. The gas in the tanks or cylinders is at high pressure. Oxygen cylinders are generally filled to approximately 2200 psi. The regulator converts the high pressure gas to a low pressure stream suitable for welding. Acetylene cylinders must be maintained in an upright position to prevent the internal acetone and acetylene from separating in the filler material. A less obvious hazard of welding is exposure to harmful chemicals. Exposure to certain metals, metal oxides, or carbon monoxide can often lead to severe medical conditions. Damaging chemical scan be produced from the fuel, from the work-piece, or from a protective coating on the work-piece. By increasing ventilation around the welding environment,the welders will have much less exposure to harmful chemicals from any source. The most common fuel used in welding is acetylene, which has a two-stage reaction. The primary chemical reaction involves the acetylene disassociating in the presence of oxygen to produce heat, carbon monoxide, and hydrogen gas: C2H2 + O2→ 2CO + H2. A secondary reaction follows where the carbon monoxide and hydrogen combine with more oxygen to produce carbon dioxide and water vapor. When the secondary reaction does not burn all of the reactants from the primary reaction, the welding process can produce large amounts of carbon monoxide, and it often does. Carbon monoxide is also the byproduct of many other incomplete fuel reactions. Almost every piece of metal is an alloy of one type or another. Copper, aluminium, and other base metals are occasionally alloyed with beryllium, which is a highly toxic metal. When a metal like this is welded or cut, high concentrations of toxic beryllium fumes are released. Long-term exposure to beryllium may result in shortness of breath, chronic cough, and significant weight loss, accompanied by fatigue and general weakness. Other alloying elements such as arsenic, manganese, silver, and aluminum can cause sickness to those who are exposed. More common are the anti-rust coatings on many manufactured metal components. Zinc,cadmium, and fluorides are often used to protect irons and steels from oxidizing. Galvanized metals have a very heavy zinc coating.Exposure to zinc oxidefumes can lead to a sickness named “metal fume fever“. This condition rarely lasts longer than 24 hours, but severe cases can be fatal. Not unlike common influenza, fevers, chills, nausea, cough, and fatigue are common effects of high zinc oxide exposure.